You must only use unleaded gasoline in your vehicle. Select octane rating 87 (research octane number 91) or higher. Use of unleaded gasoline with an octane rating lower than 87 may result in engine knocking. Persistent knocking can lead to engine damage. At minimum, the gasoline you use should meet the specifications of astm d4814 in the u.S.A. And cgsb3.5-M93 in canada. To help prevent incorrect fueling, your vehicle has a fuel tank opening that only accommodates the special nozzle on unleaded fuel pumps. In very few cases, driveability problems may be caused by the brand of gasoline you are using. If driveability problems persist, try changing the brand of gasoline. If this does not correct the problem, consult your toyota dealer. Automotive manufacturers in the u.S.A., Europe and japan have developed a specification for fuel quality called the world-wide fuel charter (wwfc), which is expected to be applied worldwide. The wwfc consists of four categories that are based on required emission levels. In the u.S., Category 4 has been adopted. The wwfc improves air quality by lowering emissions in vehicle fleets, and improves customer satisfaction through better performance. Toyota recommends the use of gasoline that contains detergent additives to avoid the build-up of engine deposits. All gasoline sold in the u.S.A. Contains minimum detergent additives to clean and/or keep clean intake systems, per epa's lowest additives concentration program. Toyota strongly recommends the use of top tier detergent gasoline. For more information on top tier detergent gasoline and a list of marketers, please go to the official website www.Toptiergas.Com. Cleaner burning gasoline, including reformulated gasoline that contains oxygenates such as ethanol or mtbe (methyl tertiary butyl ether) is available in many areas. Toyota recommends the use of cleaner burning gasoline and appropriately blended reformulated gasoline. These types of gasoline provide excellent vehicle performance, reduce vehicle emissions and improve air quality. Use only gasoline containing up to 15% ethanol. 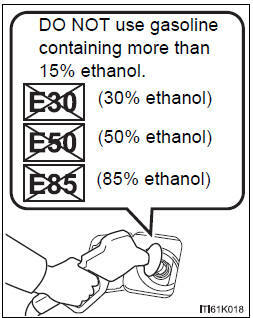 Do not use any flex-fuel or gasoline that could contain more than 15% ethanol, including from any pump labeled e30, e50, e85 (which are only some examples of fuel containing more than 15% ethanol). If you use gasohol in your vehicle, be sure that it has an octane rating no lower than 87. Toyota does not recommend the use of gasoline containing methanol. Some gasoline contains an octane enhancing additive called mmt (methylcyclopentadienyl manganese tricarbonyl). Toyota does not recommend the use of gasoline that contains mmt. If fuel containing mmt is used, your emission control system may be adversely affected. The malfunction indicator lamp on the instrument cluster may come on. If this happens, contact your toyota dealer for service. You may occasionally notice light knocking for a short time while accelerating or driving uphill. This is normal and there is no need for concern. Do not use improper fuels. If improper fuels are used, the engine will be damaged. Do not use leaded gasoline. Leaded gasoline can cause damage to your vehicle's three-way catalytic converters causing the emission control system to malfunction. Do not use gasohol other than the type previously stated. Other gasohol may cause fuel system damage or vehicle performance problems. Using unleaded gasoline with an octane number or rating lower than the level previously stated will cause persistent heavy knocking. At worst, this will lead to engine damage. If poor driveability is encountered after using a different type of fuel (poor hot starting, vaporization, engine knocking, etc. ), Discontinue the use of that type of fuel. Take care not to spill gasohol. It can damage your vehicle�s paint.